Be sure to check back for the rest of the recipes from this year's 12 Days of Cookies! Why share my tale of woe along with a recipe for the afore mentioned no-bake cookies? Only to prove to you just how easy and absolutely no-fail these cookies are! They came out beautifully on the very first try! Seriously, if I can make these, anyone can! 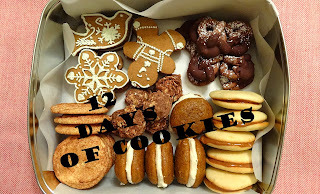 :) I figured this would be a good way to kick off our 12 Days of Cookies this year. Fast and easy cookies that are always a crowd-pleaser. What more could you ask for? A few tips: gather and measure out everything before you start. This makes it so much easier to mix things up quickly. Also, make sure you only boil the mixture for 1 minute.